Research shows a bidirectional link between depression and diabetes requiring early screening and treatment to minimize the health complications of these comorbidities in older patients. Receiving a medical diagnosis such as diabetes can be overwhelming for patients who experience a gamut of emotions, which can lead to depressive symptoms. While some patients eventually find a way to cope with their disease, others may experience prolonged sadness that can develop into major depression. And studies have shown that depression can lead to diabetes just as diabetes can contribute to depression. This relationship originated as early as the 17th century when English physician T. Willis noted that diabetes appeared in patients with sadness, prolonged sorrow, or significant life stresses.1 Many centuries later, the association between diabetes and depression is still being studied. With the burgeoning elder population who are no strangers to chronic illnesses, the links between diabetes and depression hold even greater challenges for physicians regarding care management for this patient population. 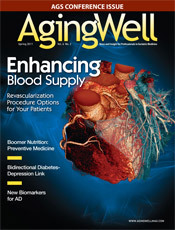 The Centers for Disease Control and Prevention estimates that more than 48 million Americans will have diabetes by 2050, with older adults being at greatest risk as the number of diabetics will triple among those aged 65 to 74, with an increase of five times its present level in those aged 75 and older.2 And the data on elder mental health issues fare no better, as 8% to 20% of older adults are diagnosed with major depression and age-associated increases in depressive symptoms.2 While studies have not fully identified the factors involved in the link between diabetes and depression, the evidence so far indicates a strong association that is important for clinicians to acknowledge, especially as they treat a growing population of older patients. “Diabetes is an equal opportunity disease: Men and women have roughly the same incidence of diabetes,” say Enrico Cagliero, MD, an associate professor of medicine at Harvard Medical School and physician in the Diabetes Unit and Transplant Center at Boston’s Massachusetts General Hospital. “Depression, instead, is much more prevalent in women than in men.” However, since men don’t usually visit their physicians with complaints of depression, “We don’t really know whether they suffer from depression or whether it’s diagnosed less frequently in men, which helps to account for the gender difference. But on average, clinicians see more depression in women than in men,” Cagliero says. Llorente says that during premenopausal and menopausal phases, some women may experience issues such as anxiety and sleep disturbances that can lead to depressive disorders. During andropause (male menopause), testosterone levels begin to decline when men are in their 40s, and they may experience depressive symptoms between the ages of 50 and 70 due to low testosterone levels, which can improve once a patient is treated with testosterone. Cagliero says screening and treatment for diabetes are not universally done, and routine checks for diabetes should begin annually at the age of 45 in patients who don’t have risk factors such as obesity or a family history of diabetes. Earlier screening is recommended in those patients with diabetes risk factors. “Diabetes is a difficult illness to take care of, and it’s difficult for primary providers because they often don’t have the time with every individual patient to address all those issues [by asking questions such as] ‘Did you see your eye doctor this year? Have you seen a podiatrist to make sure your feet are OK? Are you doing a filament test to make sure that you don’t have new neuropathy?’” Hammes explains. When it comes to screening either disease in elder patients, questioning them about how they’re feeling physically and mentally by asking if they are feeling more lethargic than usual and if they are having more trouble involving themselves in activities they previously found enjoyable will reveal clinically helpful information, Hammes adds. Diabetes and depression as single conditions are complex diseases but when combined, their synergism further complicates the treatment of older patients. Many studies have shown that treating diabetes in patients who also suffer from depression doesn’t necessarily improve the depression, and clinicians should target depression specifically.2 Some other studies show that treating depression can improve diabetes. Cagliero and colleagues are currently conducting a study to determine the effects of cognitive behavioral therapy as a stand-alone treatment for depression in improving diabetes control and adherence to medications. Significant amounts of data show that treating depression results in dramatically improved diabetes, he says. The first-line drug for diabetes is metformin because it seems to improve on resistance and has few side effects. But as patients get older, their creatinine clearance, kidney function, or liver function declines, and metformin use in these elder patients becomes less appealing, Hammes says. “The best medication for treating diabetes is really insulin, and many people are resistant to starting it. But once patients get used to taking it, insulin is really one of the easiest drugs to take and has the lowest side effect profiles and you don’t have to worry as much about renal function, liver function, and other things that can become an issue as you get older. So we are big fans of using insulin especially when control gets more difficult with time, which is usually what happens with type 2 diabetes,” says Hammes. Golden notes that atypical antipsychotics, often used in elders for sundowning and anxieties, can cause weight gain that can lead to the development of type 2 diabetes. If discontinuing these drugs isn’t an option for certain patients, then physicians should monitor their blood sugar regularly and encourage them to exercise. And while pharmacotherapy helps treat depressed patients, physicians should consider recommending psychotherapy because it helps patients identify the issues that may be contributing to their depression, especially since older patients face various challenges such as becoming widowed or being unable to participate in certain activities. Psychotherapy and medication should be encouraged because they work well together, Golden says. Patients should also consult a dietitian for further education on the importance of healthful eating habits. Dietitians are also specialized resources to help your elder patients with physical activity programs that can assist with weight loss. “It’s also a good idea for a spouse or caregiver who may be preparing the food to go to the dietitian visit with the patient because it’s really a group effort in terms of the behavioral management of diabetes,” Golden says. With respect to diabetes and depression, it’s important for family members to become involved, particularly by accompanying older patients to the physician’s office because older patients may not process information as quickly, and in a very busy primary care practice, a lot of information is given to the patient, Llorente says. Llorente says on average, studies have found that 45% of individuals who commit suicide had contact with their primary care providers in the month prior to their suicide, and more than 70% had had contact with providers within the previous year. The possibility of suicide is an important reason for physicians to recognize and treat depression, particularly in elder patients with diabetes. For suspected cases, physicians should inquire about whether a patient has thought about suicide and whether he or she has considered a plan of action. If so, the patient should be admitted for treatment because this is considered a psychiatric emergency, Golden says. Research studies have shown a bidirectional relationship between depression and diabetes, and although the root cause for this connection is complex and requires further study, the data support the connection through which depression adversely affects diabetes and vice versa. This connection necessitates efforts toward better screening and treatment among this challenging and increasing population. • There is a significant increase among patients with depression and diabetes for complications such as amputation, vision loss, end-stage renal failure, myocardial infarctions, and strokes when compared with those diabetic patients without depression. • Assessing patient self-care is important to ensure they are eating healthfully, taking diabetes medications, and staying active. • Depression in patients with type 2 diabetes is associated with a significantly higher risk of developing microvascular (eg, end-stage renal disease, low vision, blindness) and macrovascular (eg, heart attack, stroke, congestive heart failure) complications than in patients with diabetes alone. • Treating these patients encompasses a complex trade-off because research shows that treating depression improves diabetes. However, a side effect of antidepressants may be weight gain, which can undercut the progress achieved in improving diabetes while treating depression. Older adults, as the fastest growing population segment, increase the incidence of chronic illness. The bidirectional link between diabetes and depression further complicates disease management. Greater collaboration among geriatricians, psychiatrists, and primary care physicians can increase the effectiveness of patient care. 1. Lloyd CE, Hermanns N, Nouwen A, Pouwer F, Underwood L, Winkley K. The epidemiology of depression and diabetes. In: Katon W, Maj M, Sartorius N, eds. Depression and Diabetes. Chichester, U.K.: John Wiley & Sons, Ltd; 2010. 2. Trief P. Depression in elderly diabetes patients. Diabetes Spectrum. 2007;20(2):71-75. 3. Pan A, Lucas M, Sun Q, et al. Bidirectional association between depression and type 2 diabetes mellitus in women. Arch Intern Med. 2010;170(21):1884-1891. 4. Golden S, Lazo M, Carnethon M, et al. Examining a bidirectional association between depressive symptoms and diabetes. JAMA. 2008;299(23):2751-2759. 5. Gendelman N, Snell-Bergeon JK, McFann K, et al. Prevalence and correlates of depression in persons with and without type 1 diabetes. Diabetes Care. 2009;32(4):575-579. 6. Pan A, Lucas M, Sun Q, et al. Increased mortality risk in women with depression and diabetes mellitus. Arch Gen Psychiatry. 2011;68(1):42-50. • Screen patients for diabetes beginning at the age of 45. Start earlier for patients with risk factors such as family history or obesity. • Screen elder patients for depression, as it’s often misdiagnosed or undiagnosed and, left untreated, can result in complications such as poor eating habits and lack of exercise. • Many older patients take multiple medications. Recognize that certain medications (eg, atypical antipsychotics) may cause weight gain, a risk factor for developing diabetes. • Consider psychotherapy in combination with pharmacotherapy, a combination shown to work well in treating depression. • Admit a patient for evaluation and treatment by a psychiatric specialist if he or she shows signs of suicidal thoughts with a plan.